* Mi Home APP control via BT connection to smartly adjust brightness according to your preferance. * Built-in light sensor + human body sensor to light up the night light intelligently. * Sticking on the wall or hanging with a layards, convenient to use. * Great sleeping night for kids, babys, and old people. 1.Turn on BT on your smartphone. 2. Search and download the APP "Mi Home" on Google Play or App Store. 3. Create a Mi discount then sign in your discount. 4. 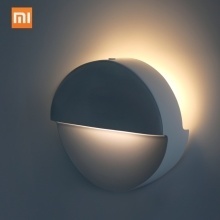 Click "+ Add device", "Devices nearby" to search the product, or manually enter the device name "Mijia BLE Night-light" and connecting. 1.The other items on the picture is not included. 2.Item color may show slight aberration due to different shooting light and monitor display.